The RDB-125 hydraulic tube bender is a powerful tubing and pipe bending machine that has a power requirement of only 110 volts, so it can work at any fabrication facility or on any job site with ease. This bending machine has been designed and built with massive rigidity in mind using only the finest industrial components and materials on the market, offering decades of profitable use. The RDB-125 pipe bender capacity is 2-1/2" OD tubing, 2" OD Chromoly, 2" square tubing, and 2" schedule 40 pipe. 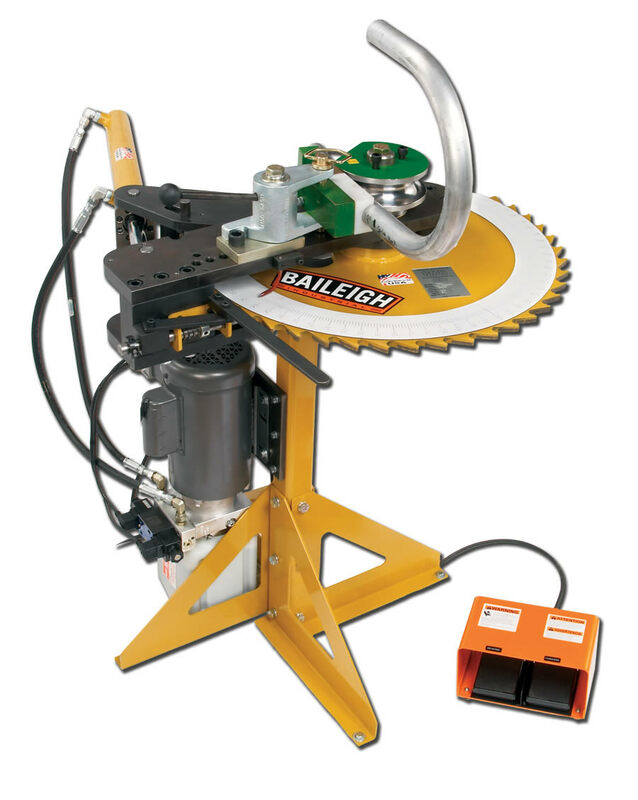 This pipe bender uses powerful low pressure industrial grade hydraulics making it quiet, quick, and very safe to use even when bending at full capacity. This hydraulic tube bender has a maximum CLR (center line capacity) of 8 inches depending on the OD of the material being bent. A quick release counter die system allows for quick loading and unloading before and after each bend, that saves time and money allowing for higher production. The RDB-125 tube bender works with hundreds of available die set sizes with centerline radiuses in 1" or 1/2" increments, with varying outside diameters. The Rotary Draw Dies are machined from the proper grades of steel offering long life. The counter die system is a three part system allowing for simple inserts (bronze and nylon) to be replaced as they wear, saving future investments during the life of the bending machine. Heavy duty bushings are used at crucial pivot points. Baileigh Industrial hydraulic tube bender machines are known for their quality of bend and repeatability. To aid with repeatability we have a very large degree dial that shows the degree of bend. Our tooling also comes with a zero degree indicator which is the start of the bend. To further assist this pipe bending machine we offer as an option, a plane of bend degree dial that helps with varying planes of bend at varying degrees, as well as proper layout software. Both recommended options save time and money during initial layout of a project at hand. This is the perfect tube bending machine for bending round or square tubing, or round pipe in material such as aluminum, mild steel, chromoly, stainless steel, and much more.